This vehicle was originally called the LVTP7 and is still referred to by this designation by some users. 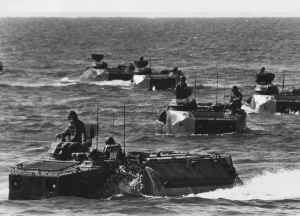 In 1985, the US Marine Corps changed this to the Amphibious Assault Vehicle 7 (AAV7). All new production vehicles were built to the AAV7A1 configuration and existing US Marine vehicles were upgraded to the new production standard. In March 1964, the United States Marine Corps issued a requirement for a new LVTP and, after evaluating a number of proposals, a contract for the development of a new LVTP was awarded to the then Ordnance Division of the FMC Corporation. In January 1994, FMC's Defense Systems Group (which included the Ground Systems Division) and BMY Combat Systems Division formed a new joint venture company called United Defense LP. United Defense became a private company in 1997 when the Carlyle Group purchased the defence interest of the FMC Corporation and the Harsco Corporation for USD850 million. In mid-2005, United Defense was purchased by BAE and the company became BAE Systems, Ground Systems. Engineering development began in February 1966 and the first of 15 prototypes was completed in September 1967 and delivered to the Marine Corps the following month. Trials with the prototypes, designated the LVTPX12, were completed in September 1969. In June 1970, the now BAE Systems, Ground Systems was awarded a contract worth USD78.5 million for the production of 942 vehicles without weapon stations. When the government-supplied weapon stations were included, the unit cost was around USD129,000. The first production vehicles, which were designated the LVTP7 (Landing Vehicle, Tracked, Personnel, Model 7) were handed over to the United States Marine Corps in August 1971 and the first unit was equipped with the vehicle by March 1972. Final deliveries were made in September 1974 after which the LVTP5A1 and its variants were phased out of service. The US Marine Corps has upgraded all its LVTP7s to the new AAV7A1 configuration and total production/conversion figures for both vehicles are given in the table. The AAV7A1 is expected to be replaced in US Marine Corps service by the Expeditionary Fighting Vehicle (EFV) covered in a separate entry. To enable the current AAV7A1 to be viable through to at least the year 2010 now that the RAM/RS programme, covered in detail later in this entry, is now underway. 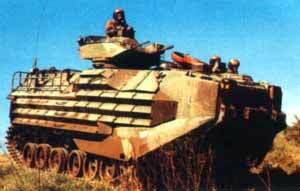 The AAV7A1 was used by the US Marine Corps during Operation Desert Storm. It was used again in operations in Iraq in 2003. In April 1995, through the Marine Corps Systems Command, the company was awarded a firm fixed price contract for a total of 14 AAV7A1 Assault Amphibious Vehicles for the Brazilian Marines under the Foreign Military Sales Programme (FMS). The order for 14 vehicles comprised 12 AAVP7A1 troop carriers, one AAVR7A1 recovery vehicle and one AAVC7A1 command post vehicle. The Brazilian Marines already operate 12 AAV7A1 (10 AAVP7A1 personnel carriers, one AAVR7A1 recovery vehicle and one AAVC7A1 command post vehicle). Engineering, management, purchasing and hull fabrication was carried out at San Jose, where production of all previous AAV7A1 vehicles was carried out, with assembly and testing being carried out at Anniston, Alabama. Production was completed by late 1996 and all vehicles have now been delivered to Brazil. The company rolled out the first two AAV7A1 vehicles in July 1997 at Samsung's research and development centre in Changwon, South Korea; this was the first time that the AAV7 series had been produced outside of the USA. The company manufactured the hull and procuring most of the major sub-components in the knockdown kits. Assembly of the vehicles, manufacture of local components and vehicle testing was carried out in South Korea in this co-operation agreement. 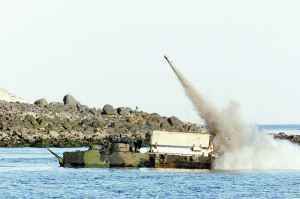 In May 1999, Samsung Techwin signed a follow-on contract with the now BAE Systems, Ground Systems for the supply of Korean Armoured Amphibious Vehicle (KAAV) Manufacturing Licence Agreement (MLA) for an additional batch of kits. The now BAE Systems, Ground Systems supplies knockdown kits and hulls while the now Samsung Techwin provides some components from companies in the ROK and is also responsible for final assembly, testing and delivering completed vehicles to the customer. Under earlier contracts, the now Samsung Techwin built 57 AAV7A1. First vehicles were completed at the Samsung Aerospace facility at Changwon in 1998 with final deliveries in 2001. This latest USD120 million contract for an undisclosed quantity extended deliveries to 2006. Prior to the local production/assembly of the AAV7A1 in the ROK, a total of 61 AAV7 and 42 of the improved AAV7A1 vehicles and variants were purchased direct from the US production line in San Jose, California. 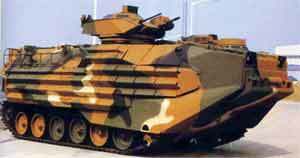 In mid-2006 it was stated that South Korea was to spend an additional USD156 million for further purchases of KAAV7A1 amphibious assault vehicles. 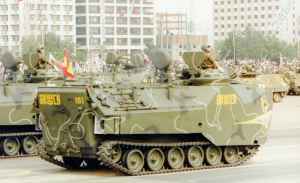 In September 1997, the company was awarded a USD40 million contract with Spain to rebuild AAV7 vehicles of the Spanish Marines to the AAV7A1 standard in Spain. The contract covered the modernisation and upgrade of 16 AAV7, two AAV7 command vehicles and one AAVR7 recovery vehicle, this being the whole Spanish fleet. In addition, the contract covered technology transfer, tools and spare parts. The actual rebuilds were carried out by Spanish subcontractor CAF, who have previously undertaken work on these vehicles. First six upgraded vehicles were handed over to Spain in July 1999 with final deliveries in July 2000. For many years Italy has operated a fleet of 24 AAVP7 personnel carriers and one AAVC7 command vehicles that have never been upgraded. Of the 24 Italian vehicles, 14 AAVP7 are operated by the Italian Army and are based at Brindisi with the remaining 10 AAVP7 and one AAVC7 command vehicles being operated by the Marines and based in Venice. Under a contract worth USD90 million awarded late in 1999 to the now BAE Systems, Ground Systems, all of these Italian vehicles were upgraded to the latest US Marine Corps Reliability, Availability, Maintainability/Rebuild to Standard (RAM/RS). Italy was the first export customer for this upgrade package which is now being marketed to other potential customers by the company. The RAM/RS work was carried out in Italy by Goriziane with the now BAE Systems, Ground Systems, providing the expertise and kits. In addition, Italy took delivery of a further nine vehicles. These were ex-US Marine Corps hulls, which were sent to Italy where they were fitted out by Goriziane to the latest standard. United Nations sources stated that Italy took delivery of a total of 13 additional vehicles in 2001 and a further four in 2002. In 2003 Taiwan (Republic of China) signed a contract under which the country will take delivery of 54 ex-US Marine Corps AAV7A1 series vehicles. These will be upgraded under the leadership of the now BAE Systems, Ground Systems, with first deliveries taking place in 2005. These vehicles will start to replace the current in-service LVTP5 series vehicles of which about 150 units are in service with the ROC Marine Corps. These vehicles are being delivered to Taiwan under a Foreign Military Sales (FMS) contract valued at USD128 million. Under the terms of the contract, BAE Systems, Ground Systems is providing remanufactured hulls, material support and test equipment, appliqué armour, litter kits and support for the AAV7A1s. The actual assembly work will be undertaken at the US Marine Corps depot in Albany, Georgia. These will be upgraded to the US Marine Corps AAV7A1 RAM/RS standard covered in detail later in this entry. The first of these 54 rebuilt vehicles were accepted into service with the Taiwanese Marine Corps in March 2006. The all-welded aluminium hull of the LVTP7 protects the crew from small arms fire, shell splinters and flash-burns. The driver sits at the front of the hull on the left side and has a single-piece hatch cover that opens to the right rear and seven day vision blocks for all-round observation. A night vision periscope can be fitted in the forward part of the driver's hatch cover for driving at night. The commander sits behind the driver and has a single-piece hatch cover that opens to the rear and seven day vision blocks for all-round observation. Forward of the commander's station is an M17C periscope which can be extended enabling the commander to see forward over the driver's hatch cover. The engine is in the forward part of the hull on the centreline and power is transmitted to the FMC HS-400 transmission via a torque converter with lock-up. The transmission combines shifting, steering and braking functions in one unit and gives four gears forward and two in reverse. The engine can be removed from the vehicle in 45 minutes and can be run outside for test purposes if required. Power is transmitted to the drive sprockets through hull-mounted final drives. A Power Take Off (PTO) mounted on the converter housing supplies power for the water-jets and the cooling fan through electrohydraulically controlled clutches. Mounted over the power pack are a fan and radiator. Air is drawn in and discharged through ballistic grills in the roof. When afloat, hydraulically actuated doors below the grills seal off the air openings. Air for the engine and troop compartment then enters the vehicle through a hydrodynamically actuated air valve mounted on the top of the hull to the right of the driver. Cooling takes place in the contact cooler, which is an integral part of the hull floor. The armament installation is beside the engine on the right side of the hull. The one-person turret has a single-piece hatch cover that opens to the rear, eight vision blocks, a sight with a magnification of ×1 and ×8 and one direct ring sight. The turret is armed with a .50 (12.7 mm) M85 machine gun with two rates of fire, 1,050 rpm (high) and 450 rpm (low). Of 1,000 rounds of .50 (12.7 mm) ammunition carried, 400 are for ready use. The machine gun has an elevation of +60° and a depression of -15°. Turret traverse, which is electrohydraulic, is a full 360°. The 25 fully equipped personnel sit on three bench seats in the troop compartment at the rear of the hull, one in the centre and one on either side. The centre seat can be removed and the two side ones folded up to allow up to 4,536 kg of cargo to be carried. The removable centre seat is stowed on the left bulkhead when not required. 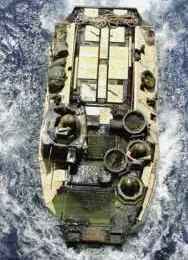 The marines enter and leave the vehicle through a power-operated ramp at the rear of the hull, which has a door in the left side of the ramp in case of ramp failure and a single vision block. Over the top of the troop compartment are three torsion spring-balanced roof hatches. The tube-over-bar suspension consists of six dual rubber-tyred roadwheels with the drive sprocket at the front and the idler at the rear. There are no track-return rollers. The first and last roadwheel stations have a hydraulic shock-absorber. The single-pin, rubber-bushed tracks have a moulded rubber top surface and replaceable rubber pads. The LVTP7 is fully amphibious without preparation, being propelled in the water by two water-jets which are mounted one either side of the hull at the rear. The water-jets are driven through right-angled gearboxes on top of the sponsons and drive shafts that extend to the rear of the hull. The water-jets, which are aluminium, are mixed flow pumps with special exhaust nozzles to maximise thrust and each pumps 52,990 litres of water per minute. At the rear of each pump is a hinged steering deflector that reverses the direction of the jet when closed. Maximum speed forwards is 13.51 km/h and maximum speed in reverse is 7.24 km/h. The tracks can also be used to propel the vehicle when afloat. Four bilge pumps are fitted: two electric (each with a capacity of 379 litres/min) and two hydraulic (each with a capacity of 435 litres/min). In addition to previously announced improvements, the AAV7A1 has a non-integral fuel tank, watertightness improved by reworking seals which surround air intakes, exhaust plenums and cargo hatches, a main wiring harness segmented for rapid repair without requiring an entirely new harness, removable headlights, a troop commander's hatch and a vision block raised for better visibility over the more forward driver's hatch. The programme was known as the LVTP7 Service Life Extension Programme (SLEP) with USD10.5 million requested in FY80, USD47.3 million in FY81 (25 conversions plus USD7.2 million for RDT & E), USD171.3 million in FY82 (149 conversions), USD116 million in FY83 (307 conversions), USD150.5 million in FY84 (263 conversions), and USD115.9 million in FY85 (240 conversions). In addition to the conversion of LVT7 to AAV7A1 configuration (this conversion programme also applied to the other two members of the family, AAVC7A1 and AAVR7A1), funding was provided to build new vehicles to AAV7A1 configuration: USD12 million in FY81, USD61.6 million (30 vehicles) in FY82, USD116.0 million (146 vehicles) in FY83 and USD115.3 million (153 vehicles) in FY84. With the later funding the additional 329 AAV7A1s for the Maritime Prepositioning Ships (MPS) were completed. In FY85, a further four vehicles were ordered at a cost of USD3.5 million. The first production AAV7A1 was handed over to the US Marine Corps in August 1983. By mid-1984, production was running at about 50 vehicles a month with final deliveries made in 1986. In March 1988, following two years of extensive tests, the US Marine Corps selected the KVH Industries MV103 militarised digital compass for use on its AAV7A1 family of vehicles. The AAV7A1 Product Improvement Programme commenced with the initial fielding of the Up Gunned Weapons Station during 1987. Up Gunned Weapons Station, bow planes and magnetic heading systems were fully fielded by 1990, as was the automatic fire sensing and suppression system. The Enhanced Appliqué Armour Kit and improved transmissions were fully fielded by 1992. US Marine Corps AAV7A1 series vehicles have also been fitted with a driver-operated extendable/retractable bow flap for increased water speed, improved visibility during amphibious operations, and to correct negative trim problem when the vehicle is afloat. In 1997, the now BAE Systems, Ground Systems was awarded a contract for the AAV7A1 Reliability, Availability and Maintainability/Rebuild to standard (RAM/RS) programme. Over the years, the addition of a heavier weapons turret, additional passive armour protection, bow plane and other improvements has increased the overall weight of the vehicle to the point of reducing some of the vehicles operational capabilities. Key parts of the RAM/RS includes installation of a Cummins diesel developing 525 hp which is a derivative of that installed in the Bradley and the installation of the suspension system from the Bradley infantry fighting vehicle used in large numbers by the US Army. These changes restored the performance capabilities of the original design requirements of the AAV7A1, especially the power-to-weight ratio. The now BAE Systems, Ground Systems the design authority for the AAV7A1, conducted hull modifications to the AAV7A1, provide teams (technical engineering and management support) and be the sole source for FMS (Foreign Military Sales) international opportunities. The assembly and test of the upgraded AAV7A1 vehicles is carried out at Marine Corps facilities at Albany and Barstow. The first rebuilt vehicle was handed over to the US Marine Corps in the spring of 1999 and under current plans a total of 680 vehicles are to be upgraded. Late in 1998, the US company Twin Disc, confirmed that it had received a contract from the now BAE Systems, Ground Systems for 170 parts sets to rebuild transmissions installed in the current AAV7A1 series vehicles. This was the first of a four-year option. Late in 1999, Italy awarded the now BAE System, Ground Systems a contract to upgrade its fleet of LVTP7 series vehicles, additional details are given in the development part of this entry. 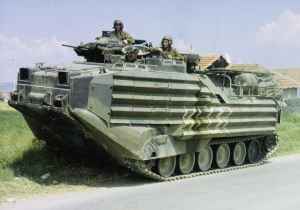 Early in 1986, the US Marine Corps Systems Acquisition Review Council considered the armour programme and recommended adopting as Phase I, an armour kit for forward-deployed AAV7A1s, as well as those with the maritime prepositioning assets. The first contract was for 189 kits of P900 (this is also fitted to US Army M113s), which consisted of a set of punched and perforated armour plates attached to the sides and sloping parts of the vehicle. 155 mm HE projectile fragments at 15 m overhead, 99 per cent probability of no penetration. The RAFAEL Armament Development Authority was selected as the sole winner of the open competition to design and fabricate three preproduction EAAKs for ballistic and field testing. Development of the EAAK was completed in 1989 and subsequently three complete preproduction prototype systems were delivered to the US Marine Corps for extensive tests. Following the successful completion of the performance and operational tests, the production option of the contract was exercised. Production of the EAAKs commenced in 1991. Production of the EAAK peaked at 80 per month with final deliveries made in early 1993. Following Operation Iraqi Freedom, additional orders have been placed for armour kits for the AAV7A1 series. Following a competition, in 2007 the US Marine Corps Systems Command awarded a contract worth USD43.9 million to L-3 Communications Cincinnati Electronics for the supply of 918 Amphibious Assault Vehicle (AAV) Thermal Sight System (TSS) to replace the current sight system in turrets installed on the AAV7A1 vehicles. This had the development designation LVTCX2 and is similar to the basic AAV7 except that its machine gun turret has been replaced by a simple hatch cover similar to that fitted at the driver's and commander's position. Armament consists of a pintle-mounted 7.62 mm M240G machine gun, with 1,000 rounds of ammunition. The AAVC7A1 also has a navigation system, a loaded weight of 21,537 kg and an unloaded weight of 19,785 kg. This had the development designation of the LVTRX2 and like the AAVC7A1 has had the machine gun turret replaced by a 7.62 mm M240G machine gun. Equipment carried includes benches, tools, an air compressor, a battery charger, a generator, a 14 to 35 V DC MIG welder, and a portable welding kit. Mounted on the roof of the AAVR7A1 is a hydraulic crane with an extending boom, which can lift 2,722 kg. The boom can be elevated from 0 to +65°. The vehicle also has a recovery winch with 84.73 m of 19 mm diameter cable with a breaking strength of 22,044 kg. The two-speed (high and low) winch has a maximum capacity of 13,605 kg on a bare drum at a low speed and 1,878 kg on a full drum at high speed. The AAVR7A1 has a crew of five, a loaded weight of 23,601 kg and an unloaded weight of 22,563 kg. The now BAE Systems, Ground Systems has a demonstration model of a track width mine system, which can be mounted on the front of an AAV7A1 and that will proof a lane previously cleared by an M58/M59 linear demolition charge. Its secondary role is to provide a mineclearing capability from the surf zone exit point, across the beach and inland, in support of amphibious operations. A contract for full-scale engineering development was awarded late in 1988. Caterpillar Incorporated has built the prototype of a track width mine plough in response to a US Marine Corps requirement. For trials purposes the AAV7A1 has been fitted with the Vehicle Magnetic Signature Duplicator (VEMASID) under development for the US Army. With the cancellation of the LVTE7 many years ago, the US Marine Corps had no vehicles with a mineclearing capability. A modular line charge system can be bolted into the cargo compartment of the AAV7A1. This is a modified M125 mine clearance system, which uses a Mk 22 rocket motor fired from an elevated launcher rail. When launched, the rocket pulls a linear charge to a range of about 550 m. Once the charge is on the ground it is detonated and this should detonate about 80 per cent of the mines for a distance of 7 m either side of the line. Production AAV7A1 vehicles have been adapted to mount this mine clearance system kit. This system is called the Mineclearing Line Charge M58/59 (MICLIC). After studying bids from Cadillac Gage (now Textron Marine & Land Systems) and the then Ordnance Division of FMC Corporation, the US Navy Sea Systems Command, acting for the US Marine Corps, placed an order with Cadillac Gage early in 1986 for the supply of 240 Up Gunned Weapons Stations for installation on AAV7A1s. The total value of this contract was USD17.236 million and the first turrets were delivered in November 1986. The Up Gunned Weapons Station is armed with a 40 mm MK 19 grenade launcher and a .50 (12.7 mm) M2 HB machine gun, has electric traverse and manual elevation, and replaces the turret armed with a single 12.7 mm M85 machine gun. The original contract for 240 Up Gunned Weapons Stations included an option for a further 100 turrets which was exercised in January 1987 at a cost of USD5.823 million. In September 1988, AV Technology Corporation was awarded a competitive rebuy contract for the Up Gunned Weapons Station for the US Marine Corps. This company has now closed.